Indulge in the perfect combination of sweet and salty with this easy recipe for cheese and honey pizza. Simple to make and delicious to eat! I know, I know, you are thinking whaaat?? She’s putting honey on her pizza? But bear with me for a minute while I say three words to you. Sweet And Salty. The familiar cheesy melty salty taste of a thin crust white pizza, mixed with just a teeny hint of a drizzle of sweet honey. I owe this all to the Southern husband, who loves white pizza above all others, and is a devoted to honey above all other sweet things. One day it hit me that maybe, just maybe, those were two great tastes that could taste great together. And Sweet and Salty came through for me again! 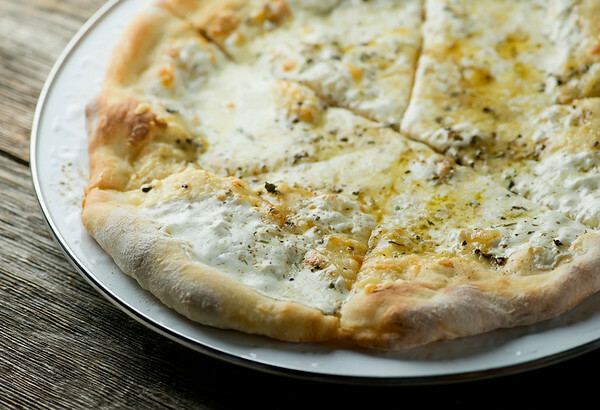 The pizza itself is the same one I made for the White Salad Pizza I posted a few weeks ago – a quick thin pizza crust that you can either buy or make, topped with a mixture of mozzarella, fontina and ricotta. Once it is out of the oven, drizzle just a tablespoon or two of your favorite kind of honey over the top. The Southern husband likes all manner of honey, but if you pressed him to name his favorite, I’m pretty positive he would go for Tupelo honey. We like the Savannah Bee Company Tupelo Honey, which you can find by clicking here. And if you want to be totally immersed in Tupelo honey, you can play the Van Morrison song while you are eating your cheese and honey pizza and if you are anything like the Southern husband, you will pretty much be in heaven. Anyway, after the honey gets drizzled on, I give everything a good old grinding of black pepper, cut it into wedges and call dibs on the first slice. Sweet And Salty. It’s a good, good thing. Top with the fontina and mozzarella, and then drop dollops of ricotta on top. Bake for about 15 minutes or until cheese is melted and the crust is golden. Remove and cool for a couple of minutes. Drizzle on honey, grind on fresh pepper, cut in wedges and serve. Throw some fresh figs on and it’s my wife’s favorite pie. Throw fresh figs and prosciutto on and it’s my favorite pie. Oh man…now I have to make it again with figs and prosciutto. GENIUS! Tupelo honey really is the BEST!!!! Isn’t it? I want to drizzle it on pretty much ev-er-y-thing.